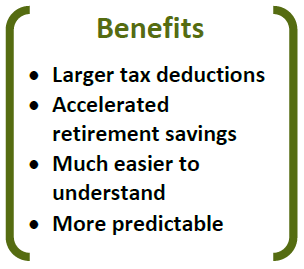 M any owners desire larger tax deductions and accelerated retirement savings. Implementing a cash balance plan may be the best solution for such owners. Recent legislature encourages more and more professionals and successful business owners to adopt this type of plan. Cash balance plans offer several benefits beyond the larger tax deductions and accelerated retirement savings. Because the cash balance plan is communicated in terms of an “account balance”, the benefits provided are more easily understood, and appreciated by employees. For example, an employee can be told that they have $5,000 in the cash balance plan. Cash balance plans take the mystery out of the employee benefit plan. Finally, cash balance plans are more predictable than traditional defined benefit plans; a participant’s account balance can be projected based on plan provisions to a future date with relative ease. No more special calculations or vague explanations. In a cash balance plan, a “theoretical” account balance (or “TAB”) is maintained on behalf of each participant. Thus, each participant in the cash balance plan has a TAB that resembles those in a 401(k) or profit sharing plan (defined contribution “DC” plans). This makes the cash balance benefit much easier to understand and is, thus, more appreciated by employees. On an annual basis the TAB is credited with a “compensation credit” and an “interest credit”. The compensation credit can be a flat dollar amount or a percentage of pay and can vary by employee. The interest credit is determined by the plan document, and will typically be a fixed 5% rate or, alternatively, could be based on a conservative index, such as the rate on 30-year U.S. Treasury Securities. These are just a few examples of the versatility of cash balance plan design. If this sounds interesting to you, please contact us. Let us build a retirement plan that is as unique as you are!